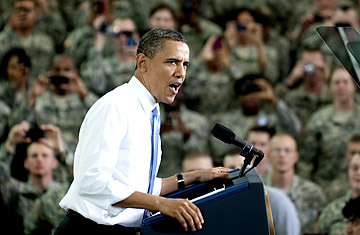 During the 2008 presidential campaign, Barack Obama made two shocking breaches of foreign-policy-establishment etiquette. The first was to suggest if the U.S. had actionable intelligence that Osama bin Laden was hiding in Pakistan, Obama, as President, would commit U.S. force to kill bin Laden. This statement of utter common sense was denounced by Hillary Clinton during the Democratic primaries. "He basically threatened to bomb Pakistan, which I don't think was a particularly wise position to take," she said. And it was similarly ridiculed by John McCain. "Will we risk the confused leadership of an inexperienced candidate who once suggested bombing our ally, Pakistan?" McCain asked. During the Oct. 7, 2008, presidential debate, after Obama had again declared that "we will kill bin Laden" if he were known to be in Pakistan, McCain said it was "remarkable" that Obama "wants to announce that he's going to attack Pakistan ... [When] you're trying to gain the support of another country, then you want to do everything you can that they would act in a cooperative fashion." We know now who came out on the right side of that debate. Obama's hawkishness on al-Qaeda in Pakistan was both politically shrewd and strategically auspicious. After taking office, Obama returned the U.S.'s counterterrorism focus to killing bin Laden. The CIA ignored the howls of Pakistani officials and set about decimating al-Qaeda's ranks along the Afghan-Pakistani border. When the time came to eliminate bin Laden himself, Obama made good on his word. And pretty much no one but Ron Paul still insists he should have checked with the Pakistanis first. Candidate Obama's second bit of strategic heresy was even more controversial: his declaration that he would negotiate "without preconditions" with the leaders of outlaw nations like North Korea, Iran and Cuba. Obama argued that the Bush Administration's unwillingness to engage adversaries had made the U.S. less secure. "I will meet not just with our friends, but with our enemies because I remember what Kennedy said, that we should never negotiate out of fear but we should never fear to negotiate," Obama said. For that, the Senator was called "naive" by his Democratic primary opponents and accused of succumbing to "the false comfort of appeasement," by President George W. Bush. And yet Republican stalwarts like Henry Kissinger, Brent Scowcroft and James Baker III all endorsed Obama's central premise: the U.S. can't solve its problems through military force alone. Effective statecraft means talking to people we don't like. Surprisingly, Obama has been less successful fulfilling his second campaign pledge than his first. After the Administration's initial overtures to Iran fell on deaf ears, the U.S. reverted to a more hard-line policy of squeezing Tehran through diplomatic pressure, economic sanctions and technical sabotage. Washington isn't any more inclined to negotiate today with Kim Jong Il, or any of his presumed successors, than it was nine years ago, when Bush inducted Pyongyang into the "axis of evil." And despite the foreign policy establishment's enthusiasm for a negotiated resolution of the Afghan war, the U.S. isn't yet truly talking with the Taliban; at best, we're still playing phone tag. There is of course reason to be skeptical about the prospects for negotiating successfully with any of those actors. Simply because diplomacy has worked with past adversaries, like the Soviet Union, it does not mean it will work now. (Mullah Omar is no Mikhail Gorbachev.) The U.S. would like Pakistan's help in rooting out al-Qaeda and stabilizing Afghanistan, but the hysterical Pakistani reaction to the bin Laden raid reveals how radically our values diverge from theirs. Rather than try to work through such feckless partners, the U.S. might seem better off pursuing its enemies on its own  with a more muscular, unilateralist approach to foreign policy. The killing of bin Laden offers a powerful argument for letting the world's most powerful military do the talking, one that appeals to many Americans. But relying on military power is a path to ruin. Abbottabad did not alter the structural realities facing the U.S. We can't afford to fight more land wars in far corners of the world. Our commitments overseas exceed our ability to keep paying for them. From Libya to Afghanistan, the Administration's paramount goal must be to establish the minimally acceptable conditions under which the U.S. and its allies can rapidly begin to extricate themselves. The political forces empowered by the spread of democracy in the Arab world are likely to be more Islamic and less friendly to the West and Israel than the autocrats they have replaced. The already moribund Middle East peace process risks complete collapse now that the Palestinian leadership has embraced Hamas, which Israel refuses to negotiate with. None of those challenges will bend to military solutions, and managing them will require active, sustained American diplomacy. And that includes being open to making deals with various miscreants  Gaddafi, the Taliban, Iran, Hamas  we'd prefer to vanquish. Obama secured one foreign policy legacy  and possibly his re-election  by eliminating bin Laden. To advance America's long-term interests in a turbulent age, the President now needs to prove he's strong enough to engage America's enemies, and not just kill them. Ratnesar, a TIME contributing editor-at-large, is a Bernard L. Schwartz Fellow at the New America Foundation and the author of Tear Down This Wall: A City, a President, and the Speech That Ended the Cold War. His column on global affairs usually appears on Mondays on TIME.com. See why the U.S. is stuck with Pakistan.